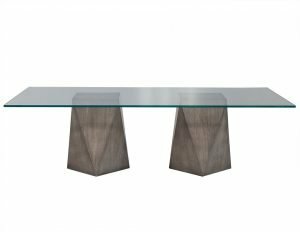 This modern dining table is made to order. 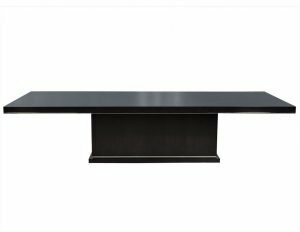 It is crafted out of thick glass sitting atop a lacquered, sculpted and beveled base with hidden reinforced steel. Underneath the glass are eight round, polished, steel support pieces that keep the tabletop in place. A simple yet beautiful piece perfect for an ultramodern home.